Gets or sets a value that indicates whether grid lines are visible within this Grid. true if grid lines are visible; otherwise, false. The default value is false. Enabling grid lines creates dotted lines around all the elements within a Grid, as shown in the following illustration. Only dotted lines are available because this property is intended as a design tool to debug layout problems. Setting ShowGridLines to true is not intended for use in production-quality code. 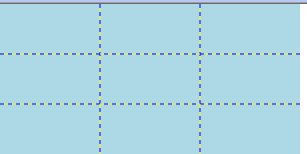 If you want lines inside a Grid, style the elements within the Grid to have borders. For more information, see Border.